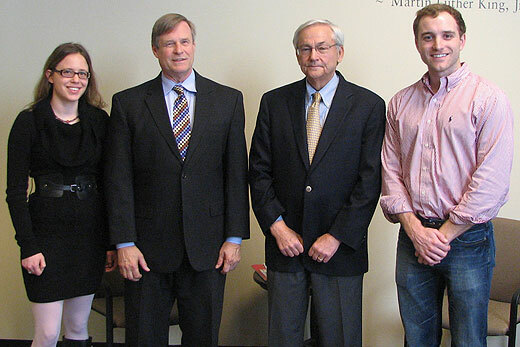 Left to right: Law student Rachel Erdman, Professor and Co-Director Charlie Shanor, Adjunct Professor and Co-Director H. Lane Dennard Jr., and law student Martin Bunt. The Emory Law Volunteer Clinic for Veterans began accepting cases in February. "Our veterans are coming home to a fairly tough economy, some with profound mental and physical injuries," says Charles Shanor, professor of law at Emory and the clinic's co-director. "I’m proud our students will help make sure they and their families receive the assistance and rehabilitation they have earned." National Security Law Society second-year students Martin Bunt and Rachel Erdman worked with Shanor, an expert in military and counterterrorism law, to form the group which will allow students to earn pro bono and public service hours. a case before the U.S. Court of Appeals for Veterans'Claims, says Shanor. Both the Military-Veterans Law Section and Military Legal Assistance Program of the Georgia Bar actively support the clinic, he says. The clinic grew from student interest and builds upon the work of clinic co-director and adjunct professor H. Lane Dennard Jr., a retired partner at King & Spalding and a highly decorated U.S. Army veteran who received the Silver Star, Air Medal, Army Commendation Medal, and Purple Heart with Oak Leaf Cluster. His experience includes cases involving PTSD and TBI disability claims, survivorship rights, pensions, total disability based on un-employability and appeals. In 2011, Dennard received the Georgia Bar’s Marshall-Tuttle Award as the top lawyer in the state providing pro bono service to veterans. "The clinic recognizes veterans'critical need for informed legal counsel during the VA disability claims process and especially the appeals," Dennard says. "It also gives Emory Law students valuable experience in federal administrative proceedings." There are roughly 770,000 veterans in Georgia, and more than 200,000 live in the Atlanta metropolitan area, according to Dennard. Many have returned from Iraq and Afghanistan with service-connected injuries. "Older veterans, including those who served in Vietnam and prior wars, also have disabilities associated with their prior military service," says Dennard. "Many of these men and women who have served their country have legal issues, both related to their disability claims and other civil matters." The clinic will initially receive referrals from the Military Legal Assistance Program Committee of the Georgia Bar and the Veterans Legal Clinic at the VA Hospital in Decatur. The clinic is also developing additional referral resources, including the National Veterans Legal Service Program, the Veterans'Consortium Pro Bono Program, and the Service Women’s Action Network. Clinic students also will work with pro bono lawyers on an initiative to establish a Veterans Court in Georgia. Such courts recognize veterans may suffer from severe depression, PTSD, brain injuries, chronic pain or substance abuse, which can contribute to criminal behavior. The goal is to offer medical treatment and monitoring thorough the Veterans Administration as an alternative to standard criminal sentencing.